Few cars over the years have caused such a str in the industry as much as the Chrysler 300C. First shown in 2003 at the New York Motor Show, Chrysler knew the 300C would be a sure-fire hit. It has good looks, great performance and plenty of space. With lots of technology and gadgets thrown in too, it makes for an affordable and stylish second-hand purchase. 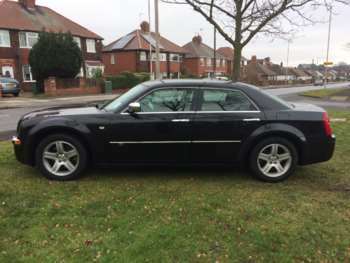 There are a couple of models to choose from in the range of used Chrysler 300Cs for sale at RAC Cars, because of the variations that were introduced throughout the years. The pick of the bunch is probably the Hemi 5.7 litre V8. At low speeds the V8 runs on just four cylinders, meaning you get relatively respectable MPG figures. Then when the mood takes you, all eight fire up and you’re away. Thanks to Chrysler’s list price of the 300C being so low, used Chrysler 300C prices are now very low. It is a very large car both inside and out, so if you want a saloon that’s both affordable and very large, the 300C is your motor. The 300C is a typical muscle car and offers good performance for the price. The V8 versions are impressively quick in a straight line, you just need to be careful not to push them too hard around the bends. The steering wheel is massive, and the suspension is soft, making for a great driving experience. If you require a saloon that offers presence and power, you’d be hard pressed to find a cheaper candidate with more toys and tech.